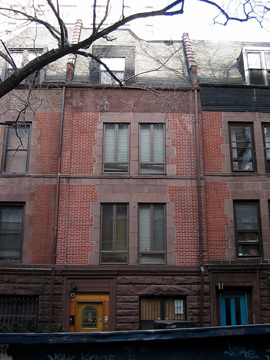 Clyde Haberman's column (registration required) in the New York Times this morning was about the house Virginia O'Hanlon lived in at 115 W. 95th St. when she wrote her famous letter to the New York Sun in 1897 asking if there was a Santa Claus. The column is about efforts some people have made to have a plaque put on Virginia's house, or to find some other way to acknowledge her letter and Francis Church's replay. What the Times didn't do was publish a photo of the house. It also doesn't appear that Haberman made any effort to talk to the owner of the house. I was on the Upper West Side this afternoon, so I walked over to 95th St. and took this photo.